For application of cervical traction when prescribed by a physician. This kit contains everything needed for vertical traction in the clinic or home. Includes standard overdoor frame with nonslip rubber grips, deluxe universal head halter, 20 lb. (9.1kg) water weight bag, spreader bar, traction cord and “S” hook. 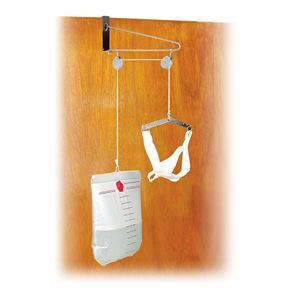 Just place the bracket on top of the door, adjust cord length and fill water weight bag for desired traction. Universal head halter is made of canvas and foam. Designed to pull the occiput, not the chin. D-rings on overhead strap allow for sizing adjustments. Straps fasten to chin cup with hook and loop for easy adjustment.